Reykjavík is the capital of Iceland and is among the safest, greenest, and cleanest cities in the world. There are plenty of things to do in Reykjavík itself and even more if you’re willing to drive out of the city, or go on one of the many trips. Gullfoss Waterfall – This iconic waterfall is considered by many to be the country’s most beautiful fall and is about an hour and a half drive from Reykjavík, or if you don’t fancy driving, you could always go on a ‘Golden Circle’ helicopter tour. As one of the most popular tourist attractions in Iceland, Gullfoss is now protected and owned by the state of Iceland. There’s a walking trail with good viewing points, however this is closed during Winter due to the snow. Hallgrímskirkja – Hallgrímskirkja is the largest church in Iceland and has a 73 metre high tower giving a fantastic view over all of Reykjavík. This stunning 360 view makes it one of the most visited tourist destinations in the city. During winter the church is open 09:00 – 17:00 with the tower closing at 16:30, and during the summer the opening hours are 09:00 – 21:00 with the tower closing at 20:30. The tower is also closed on Sundays from 10:30 – 12:15 due to mass. Admission costs ISK 900 per adult and ISK 100 for children aged 7-14. National Museum of Iceland – This museum focuses on the history of Iceland and provides an insight into the history of the nation. The ‘Making of a Nation’ exhibit includes around 2000 objects with dates ranging from settlement to present day, and about 1000 photos from the 20th century. There are also various temporary exhibits throughout the year. Admission is ISK 2000 for an adult or free for under 18’s and it’s open from 10am – 5pm everyday, except Mondays between 16/9-30/4. The information panels are in English and there is also an audio guide available for ISK 300. 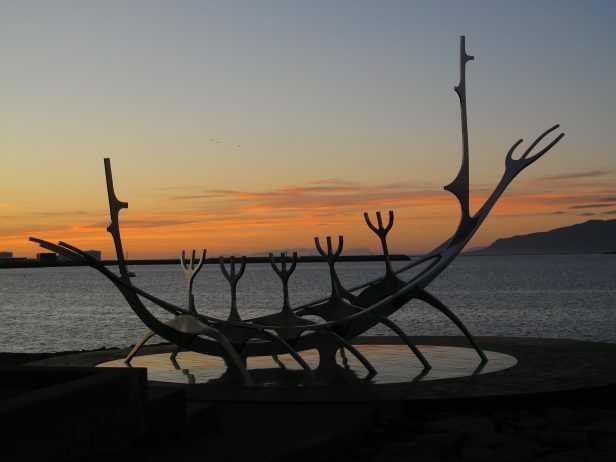 Other attractions include: a day trip to see the Northern Lights, the Solfar (Sun Voyager) sculpture on the sea front, and the Harpa Reykjavík Concert Hall which is a beautiful building to look around even if not attending a performance. Canopy by Hilton – This hotel is located in the Reykjavík 101 district and is in the heart of the city; it’s only 450 yards from the iconic Solfar Sun Voyager sculpture. If you don’t fancy walking around you could always rent a bike to explore the city. There’s also a 24 hour fitness centre and free Wi-Fi throughout the hotel. For dining, the main option is Geiri Smart, a exclusive dining experience where the menu is ever changing depending on the available local produce. It’s open for lunch from 12-2 and dinner, Sunday to Thursday 6-10 and Friday/Saturday 6-10:30. There is also the Canopy Central Bistro and Bar that serves nibbles and beverages throughout the day from 11:30am-9pm. Food Cellar – This restaurant specialises in Icelandic brasserie style food using the finest ingredients Iceland has to offer. You can order a la carte or try one of the tasting menus. The Secret Menu, a six course chef’s choice meal served for the whole table, and the Icelandic Discovery Menu, four courses consisting of traditional Icelandic flavours such as Puffin and cured salmon, are both highly recommended. It’s open for lunch during the week from 11:30 – 15:00, and for dinner every night from 17:00 – 23:00. Reservations can be made online and the full menu can be found on their website.